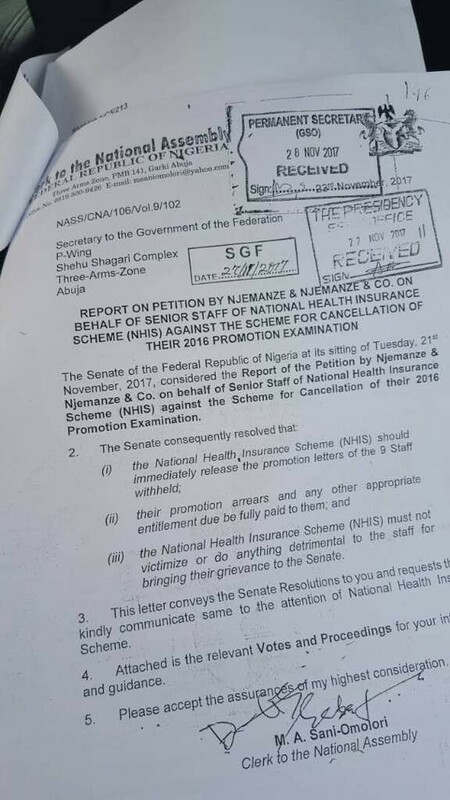 A distress response letter from the red chamber of Nigerian National Assembly has revealed how promotion letters of nine staff of National Health Insurance Scheme (NHIS) has been wrongly withheld by the scheme. The letter, a copy of which leaked to the media on Sunday conveyed the resolution of the Senate on wrongful withholding and denial of promotion letters of nine Staff of NHIS for the year 2016. The letter was addressed to the Secretary to the Government of the Federation (SGF), Boss Mustapha. The letter, dated 23rd November, 2017, wants the SGF to communicate the resolution of the red chamber to the authorities of the federal ministry of health which is the supervisory ministry of the NHIS. The copy of the letter showed that it was acknowledged at the office of the SGF on Monday 27th November, 2017. The sighted letter also revealed that, it was recieved and acknowledged by the office of the minister of health on Friday 8th December, 2017. The SGF through the office of his permanent secretary, wrote the Minister of Health Prof. Adewole conveying the Senate’s resolutions for onward transmission to the NHIS. The letter Ref. No. 59495/S.3/C5/213 dated 7th December, 2017 reads, “I wish to refer you to the attached copy of a letter Ref. No. NASS/CNA/106/VOL. 9/102 of 23rd November, 2017 from the clerk of the National Assembly in respect of the resolutions passed by the Senate of the Federal Republic of Nigeria at its sitting of 21st November 2017. The Senate resolved after considering the report of the petition of Njemanze & Njemanze & Co against the NHIS, that the “NHIS should release promotion letters of staff, all promotion arrears and entitlements must be paid. NHIS must not punish or do anything against the staff for bringing the issue to the Senate and, the committee on health to ensure compliance to Senate resolution”. Furthermore, the SGF stated in his letter “May I draw your attention to issue raised therein for your information and necessary action as the matter falls within your purview”. The petitioners were said to have sat for promotion examination in June 2016, passed, and were wrongfully denied their letters of promotion thenafter leading to their lawyer, Njemanze & Njemanze & Co petitioned the NHIS on the grounds that, the withholding and denial of their promotion was ‘wrong and in error’.